Last week I spoke on open access at the annual conference of Research Libraries UK (RLUK). I did so at the end of a session that also featured Dame Janet Finch, who had chaired the working group set up by the government to make recommendations on expanding access to the scholarly literature in the UK, and Mark Thorley, the public face of the new policy on open access developed in the light of the Finch report by Research Councils UK (RCUK), the body that oversees much of public spending on research. Mark and I had already met, at an open access debate at Imperial College back in September but this was the first time I had encountered Dame Janet. Having spent time reading her report back in the summer, I was pleased to discover that she had in turn read some of my output on the topic of OA. The conference was a good opportunity to talk to both Mark and Dame Janet and to get a better insight into the thinking behind the Finch report and the new RCUK policy. Some of the more colourful remarks made are off the record, I’m afraid, but there is still plenty of information to be gleaned from the presentations made, which were recorded and have been uploaded to YouTube (thanks to the good offices of RLUK’s Melanie Cheung). Dame Janet spoke first (video)— and was very open about the remit and process of her working group. I was intrigued to hear her confess that she hadn’t known much about open access before being asked to take charge of the committee (though she was briefed in detail by Phil Sykes and Paul Reynolds, chief librarians at Liverpool and Keele Universities respectively). I guess the government was looking for an academic without a preconceived agenda to lead development of new policy recommendations. I recommend that people listen to the talk — or at least the opening remarks — to get a feel for Dame Janet’s sense of her committee’s mission and the response to it. It adds the human (and sometimes humorous) dimension to a debate that has at times been fractious. I wish she would speak more often about the thinking behind the report since it would open the conversation on open access to a broader audience. Her talk was revealing in ways that the report is not: in particular Dame Janet was up front about the responsibility imposed by the working group’s remit not to damage the publishing industry. This is something that many had detected in reading the report, but I had not previously heard it stated so boldly. Of course such a provision makes some sense for a government-led initiative, keen to protect profitable businesses in the UK, but of course there are tensions between that and the need to secure good value for money on public spending and to see through the project of making open access work on a global scale. One has to wonder whether the remit not to do damage led the group to underestimate the impact of technology-driven changes that are by their own momentum making paper-based publishing obsolescent and inducing a fundamental re-think of the nature and process of scholarly publishing. No-one seems quite sure, including Dame Janet, who has been charged with reviewing the situation in about a year’s time. For this reason continued constructive engagement in open access issues by all stakeholders will be important. Next up was Mark Thorley (video) who laid out the thinking behind the interpretation of the Finch report that is enshrined in the RCUK’s new policy on open access (already covered in his blogposts). Mark was able also to spell out some of the details on the financial provision — announced last week — and how it will be allocated to universities. The approach is pragmatic, reflecting an expectation that there will be significant but not immediate growth in uptake of gold OA routes once the policy goes live in April next year. The plan is to ramp up funding steadily to cover predicted article processing charges (APCs) of 45% of all RCUK output in 2013, rising steadily to cover 75% by 2017. The expectation appears to be that by then the remaining 25% will be made OA by the green repository routes. The RCUK will operate a ‘light touch’ regime of monitoring how the money is spent, again reflecting a degree of pragmatism (rooted sensibly in the remaining uncertainty about how things are going to pan out). However, there are some important points to take on board. Though the details of mechanisms are yet to be finalised (RCUK held a meeting with universities to discuss this on 13th Nov), Mark made a clear acknowledgement that monitoring of compliance with OA policies had been weak in the past and that this would be much stronger from next year, an assertion that applies irrespective of whether RCUK funded research is published by gold or green OA routes. Although the preference for gold OA remains, he again made it clear that researchers are free to choose green OA routes for their work if this is what they (and their institutions) would prefer to do. A further point of interest is that RCUK will gather data on what different institutions are paying for their APCs and, crucially, will publish this information so it can be used in negotiations with publishers to reduce subscription charges. This should help to ease the cost of the transition by focusing attention on the need to couple increased use of APCs in the UK with lower institutional subsciptions. Finally it was my turn to speak, to give a researcher’s perspective. I won’t go into details since my arguments have already been developed at extravagant length on this blog. For newcomers, it will probably be quicker to sit through the whole 30 minutes of my talk. Apologies. Alternatively, skim through the slides. It’s good to talk. I was glad to have the opportunity to address research librarians. They are an important group of stakeholders in the messy business of open access who are the natural and expert allies of academics. In many institutions around the country they have already begun to think about how to implement the new policy. One thing that I did try to impress on those present was that, whatever procedures are to be put in place, we must ensure that researchers are exposed to the actual costs of publishing so that they can make informed decisions about the best route to open access for them. Only with visible costs will we develop a functioning market in scholarly publishing that pays sufficient attention to the proper balance between price and quality. But the duty of implementation falls not only to librarians. Researchers are just as responsible for making OA work but, unfortunately, many have yet to pick up this issue with serious intent. They are too busy and too inured to traditional modes of operation (and impact factors). But we need to talk to more of them so that this issue can break out of library committees and out of the blogosphere. Ideas for how to do that are most welcome. This entry was posted in Open Access and tagged Dame Janet Finch, Mark Thorley, open access, RCUK, RLUK. Bookmark the permalink. I still don’t understand why it was a given in the working group’s remit that it had to make recommendations that would not risk harm to commercial publishers. How is it the UK government’s job to prop up those businesses? Politics. You might think a Conservative-led coalition would trust the free market but I guess they didn’t want to risk being seen responsible for a policy that might cost jobs in the UK, especially in a time of widespread cuts and job losses elsewhere. Second observation: at 10:50, a slide is up titled “Different parties have different interests”. Five parties are listed. Of these, it’s clear that the interests of our of the parties (universities, researchers, research funders and libraries) are aligned. I need hardly say that the fifth party is publishers. This layout of goals makes the subject of my previous comment all the more inexplicable to me. “The responsibility imposed by the working group’s remit not to damage the publishing industry” is essentially a responsibility to sell all the other four parties — and the public — short. Is the working group’s remit online anywhere? I’d be interested to see exactly what it says about this, and what reasoning it offers. Not sure. 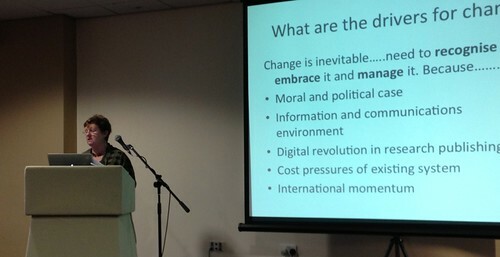 Dame Janet was fairly clear in defining her remit in her talk. First time I’d properly seen it enunciated. But I wouldn’t get too hung up on the report. The RCUK policy has already superseded it in some ways and been modified (or is that ‘clarified’) along the way. It seemed very clear to me from last week’s conference that both Finch and the RCUK are listening attentively to the reaction in the academic community. That’s why I think it’s so important to keep the lines of communication open and to get more people involved. Last slide … “Walk-in access via public libraries”. I’d completely forgotten about this. Does anyone think it’s a good idea? Is there anyone out there who will use it? I imagine there are some but this is no longer the right solution for open access. Was it ever? I can’t take seriously the idea that anyone ever thought that a “solution” that involves physical travel to access an electronic resource is even sane, let alone right. I wonder if there’s any way to prevent money being wasted on this? All it will achieve if to give the traditional publishers a big stick to beat the “see, no-one really wants open access” drum when no-one turns up. A charming and articulate presentation. (1) The first is that there is no thought of the need for a “Plan B”, should the rest of the world not go in the same direction as the UK (as it almost surely will not). The UK proposes to make a huge unilateral investment in pre-emptive payment for Gold OA for UK output (6% of world output) while the UK also has to go on paying subscriptions for input from the rest of the world (94%). About 6% double-payment to publishers, all from the UK (subscription fees plus Gold OA fees), and nothing more to show for it (6% OA is not OA). (2) The second is mention of a “transitional mixed economy” and funding of Repositories — but what is meant is a Gold/subscription “mixed economy” whereas what Green OA repositories need is not money but (effective) mandates — to fill them with UK research output. Precisely what the Finch report makes no mention of doing. (3) The emphasis on the need for re-use rights is greatly exaggerated: Mandatory Green OA provides what is most urgently needed for research and researchers (including a lot of re-use and text-mining capability). And again; this is not a unilateral UK matter but requires concerted global action: the rest of the world is moving toward the far more affordable, scaleable and sustainable solution of mandating Green OA. (4) Much allusion to the need for publisher viability, without noting that publishers are doing well, worldwide, with subscriptions. Mandating Green OA globally will generate universal Green OA and then that will either co-exist with subscriptions or, more likely, it will cause cancellations, forcing publishers to cut obsolete products and services and their costs and to downsize to the post-Green OA essentials, their much reduced costs paid for on the post-Green Gold OA model, out of the subscription cancelation windfall savings generated by universal Green OA, instead of double-paid, pre-emptively, on the UK’s Finch Gold OA model. (5) Biomedical research publishes proportionately more Gold OA than any other field of research, but it certainly does not provide more proportionately more OA than other fields: many other fields provide far more OA tha biomed — but via Green OA.